Home Common Mistakes Anyway Vs. Any Way: Differences and Usage? ♦ Anyway is an adverb which has different meanings in variable situations. ♦ Any way means ‘in any manner’. The English language is full of confusing words and today we’ll deal with one such confusion. ANYWAY and ANY WAY is one such example. अब सवाल ये है कि इस फर्क को कैसे पहचाना और correct किया जाए? Well, that’s what I’m here for fellas, so let’s get going. Anyway is an adverb (क्रिया विशेषण) that, in simple words, modifies the meaning of an adjective, verb, or other adverbs. Anyway शब्द का English में अर्थ है ‘regardless‘ or ‘in any case’. I know it’s impossible to convince her, but I’ll try anyway. Good that you came yourself, I was going to call you anyway. Anyway, as I said already, I am not going to the party. Anyways is the colloquial form of the word ‘anyway’. You can and should use ‘anyways’ only in informal speech as it’s synonymous to anyway. If you want to avoid the death stare from the ‘Grammar Nazis’, try not to use anyways, EVER! But if you don’t care, you can use it anyway. जब किसी काम को करने के एक से ज़्यादा तरीके हों, तब हम प्रयोग करते हैं ANY WAY as in ‘It can be done any way’. यदि आप imagine करें कि आप अपने घर की तरफ जा रहे हैं और चलते चलते एक दोराहे पर आकर खड़े हो जाते हैं। यदि वे दोनों रास्ते आपके घर कि तरफ जाते हैं तो आप किसी भी रास्ते को चुनें, आप घर पहुँच जाएंगे।ऐसी परिस्थिति में you can go any way you want to. • You can solve this problem in any way. • I don’t care, you have to do it any way. • You can solve this problem in any manner. • I don’t care, you have to do it by any means. So, that’s all you need to know here. 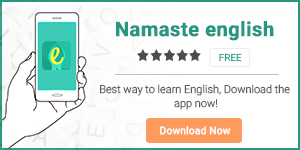 इसी तरह अपनी mistakes को सुधारने के लिए और बेहतर English बोलना सिखने के लिए download करें हमारी English learning app Namaste English.